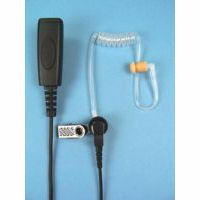 Mid-Range Acoustic Tube Earpiece & Mic. Features a clear coiled acoustic tube earphone. Better quality than our basic range. With the same excellent crystal clear audio. Soft surgical rubber eartip for comfort. The PTT is a high quality design with built in microphone. The wires being kevlar reinforced provide excellent strain relief. Replacement rubber eartips are available for hygiene as are replacement acoustic tubes. Hygienic clear rubber replacements for use with eartube earphones.